Have you ever had a sore neck that sounds almost impossible to get rid of it? If you want to get rid of neck pain, then go through this article which helps you to solve it. Neck pain is a very natural medical condition that occurs due to any abnormality in the structures of the neck, which includes nerves, muscles, bones (vertebrae), and the disks between the bones. Neck Sore and Shoulder neck Pain can be classified into many ways. Some of us experience either only neck pain or only shoulder pain, while others experience pain in both areas. The Sciatica is the usual type of pain affecting the sciatic nerve which is a large nerve extending from the lower back down the back of each leg. Many people experience neck pain occasionally due to stress, imperfect sitting postures, uncomfortable sleeping positions, neck injury during exercise, Cervical Strain, ergonomically lacking workstations and whiplash. Additionally, chronic neck pain can cause the irritation along the nerve pathways can cause pain into the head, shoulder, arm, and hand. Irritation of the spinal cord can cause pain into the legs and other areas below the neck. Sometimes it occurs due to Degenerative diseases like osteoporosis, fibromyalgia, and arthritis. Aging is also brought neck pain in some individuals. Let us take a look at the cause of Sore Neck from the following sections. If you have a pinched nerve in neck, your body may send warning signals such as pain. Don’t ignore these warning signals. What are the Causes of Sore Neck? Check the neck pain causes from the following content. Working at a desk for too long without altering the position. Abnormalities in the joints or bone. Most of the time, Sore neck is not a serious and can be relieved within a few days. If it certainly makes you feel unbearable by restricting the movement of your neck in some cases then consider it as a critical issue. The sore neck can intimate serious injury or illness which requires a doctor’s care. If you have a sore neck that continues for more than a week, it is severe or is lead by other symptoms, seeks medical observation immediately. If you are suffering from a kink in neck, it ‘s hard to perform everyday work with ease. There are many remedies that you can use to get rid of Sore neck. Let’s know more about neck pain relief remedies to get rid of severe neck pain! Heat Pack relieves the neck strain by improving the blood circulation to that particular area. Heat Pack also makes the stiff muscles flexible, which helps to decrease the pain in neck successfully. A Bottle of Hot Water or a Heated Gel Pack. Keep the hot water bottle or the heating pad on the strained neck. Leave it for 10 to 15 minutes then remove it from the neck. Repeat this method for every 3 – 4 hours to get neck pain relief. Note: Do not use extremely hot water as more heat can worsen the condition. 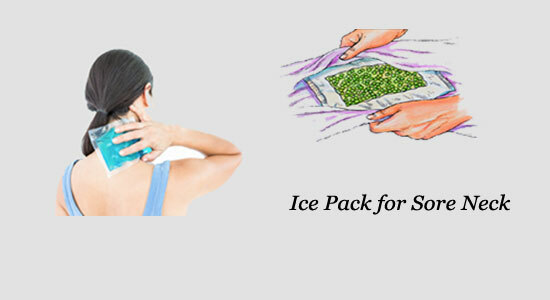 This Ice pack helps you to get rid of neck muscle pain that is caused due to swelling of the neck muscles. This neck ice pack numbs the pain and lowers the inflammation effectively. A Chilled Gel Pack or A Frozen Peas Bag. Take some Ice cubes/A Frozen Peas Bag and wrap in a towel or Ice Gel Pack. Keep the ice pack on the stiff neck, not more than for 15 minutes. 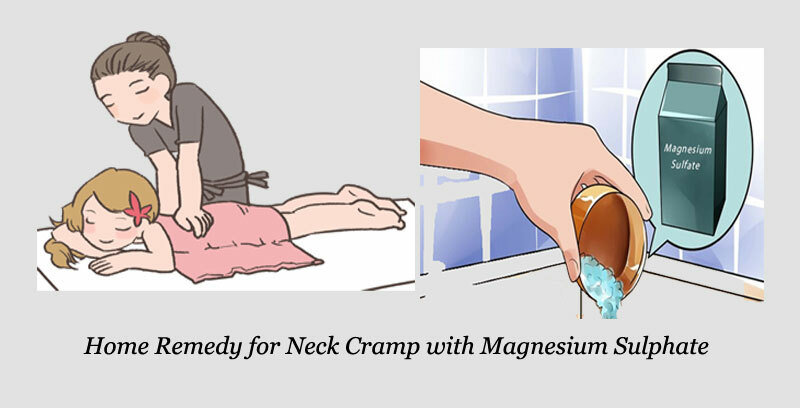 Repeat this remedy every two to three hours for to get relief from neck cramp. Note: Do not apply ice directly on your skin. This Heat and Cold Compress remedy combine both heat compress and cold compress. This will give you quick relief from the sore neck by giving flexibility to the strained neck muscles. It will also help the stiff neck muscles regain its strength quickly. A Bag of Frozen Peas or A Cold Gel Pack. 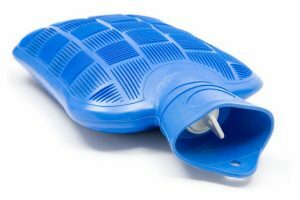 A Bottle with Hot Water or a Heated Compress. Place the heat pack on the neck sprain for 15 minutes. Remove the heat compress and place the ice pack on the neck for 15 minutes. Follow this steps in every 2 to 3 hours to get rid of neck pain. Magnesium sulphate helps you to provide relief from the stiff neck as it makes the calcium soluble in the body which helps it to enter into the bones. Apart from that, Magnesium Sulphate also mineralizes the bones and repairs the damaged cells which contribute to relieving the neck and back pain. Take few drops of Magnesium Sulphate oil in your palm and massage it on the neck area. Massage this oil 2 -3 times a day to get quick relief from neck cramps. Epsom Salt Bath can improve circulation, relieve pulled muscle in neck, and reduce stress. 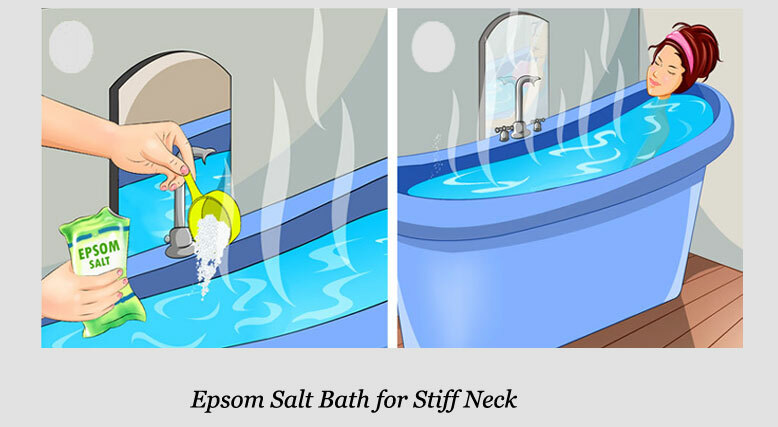 Soaking in Epsom Salt water can be very beneficent for the release of neck muscle pain. Epsom salts are made of magnesium and sulphate. Magnesium helps regulate the rate of calcium binding as well as raising serotonin levels in the brain. Some things as simple as an Epsom Salt bath is a great benefit in relaxing a tight neck muscle. Check the Epsom Salt remedy to get rid of Neck pain from the below section. Epsom Salt – 2 Cups. Warm Water ( prefer Luke warm water). Mix two cups of Epsom Salt to a bathtub full of Luke warm water. Soak in this warm water for 15 to 20 minutes, allowing the Magnesium to be absorbed through your skin. Repeat this for three times a week to get complete relief from neck pain. The neck exercises that are mentioned below are straightforward and easy to do, which will help you to get rid of neck pain that is caused due to poor posture. You need to perform these Neck exercises in a sequence, which will reduce the neck pain by repositioning the head and load-bearing joints (hips, shoulders, ankles, and knees). Find the sore Neck spot. If you have pain in right side of neck or upper back, place your right hand on the area. If you have pain in the Left side of the neck, use your left hand. Press into the knot with your fingers, using firm pressure to get relief from Stiff neck. Tilt your head slowly back and forth. Repeat this for ten times. Tilt your head from side to side. Take a rest of 2 minutes if you begin to feel any pain. Sit up straight, rotate your head clockwise and repeat same with anti-clockwise. Sit up straight in a chair and grab your head with both hands. Gently bend backwards and look up toward the ceiling. Repeat this for ten times. Do this several times in a day to get rid of Neck pain. The Hydrotherapy is a process that uses water as the treatment method. Hydrotherapy is effective for the stiff neck. Target the neck against the shower with lukewarm to hot water for three to four minutes. Turn the water to its cold setting and target the neck for 30 seconds to a minute. Repeat as many times as necessary. 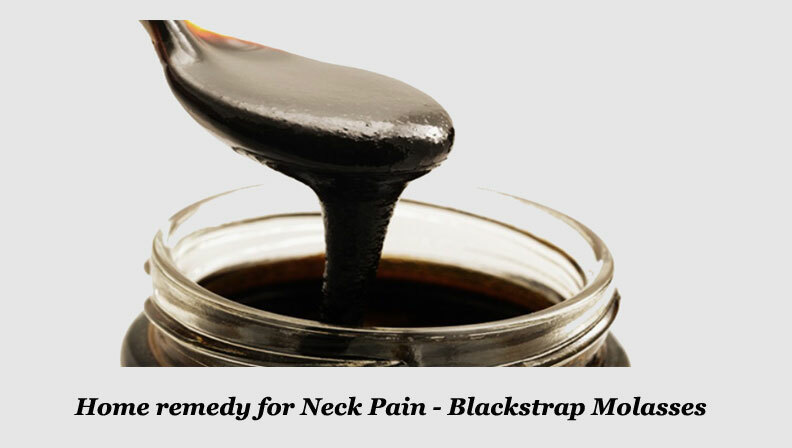 Blackstrap molasses is a rich source of potassium and calcium can help you to get rid of neck pain. In some cases, neck pain is caused due to calcium and potassium deficiency. Blackstrap Molasses- 1 Table Spoon. Mix 1 Table Spoon of blackstrap molasses in 1 glass of lukewarm water and drink it. 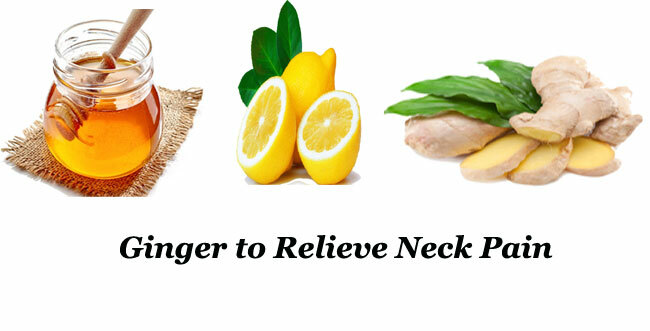 Take this remedy for two times a day to relieve the neck pain. 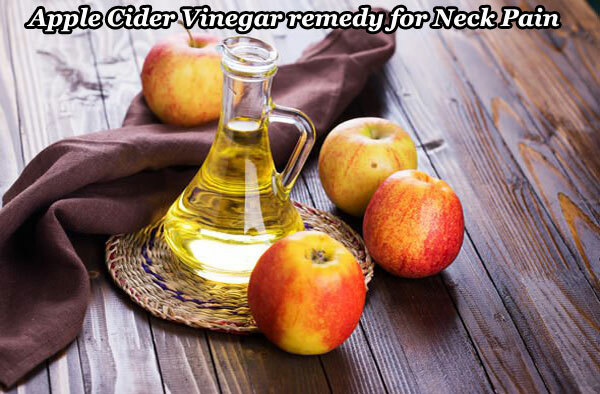 Apple Cider Vinegar is a strong antioxidant & anti-inflammatory that help to reduce the neck pain quickly. The apple cider vinegar is nutrient-rich which relieves the neck pain if it is caused due to the deficiency of nutrients. The Apple Cider Vinegar can help to prevent muscle strain and pain related to nutrient deficiencies. Apple Cider Vinegar – 2 tablespoons. Soak your towel in apple cider vinegar. Wrap the towel around your neck for a couple of hours. Repeat this step again till the pain is gone. Mix two cups of apple cider vinegar to warm bath water. Soak apple cider vinegar in it for at least 15 minutes once daily until you recover completely. It can be used to ease the Neck pain. 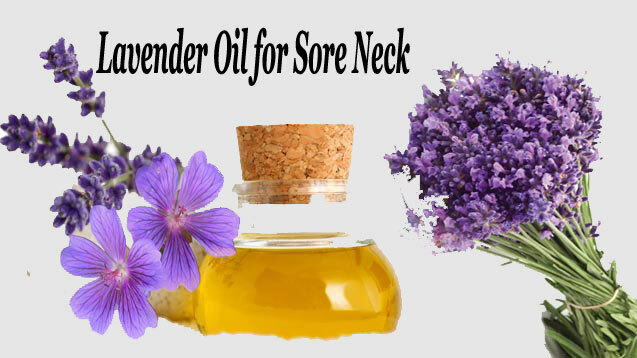 Lavender Oil is used while giving massage to the neck. Nothing Compete to the magic of a good and soothing massage. Gently massage the affected areas using essential oils such as pine, rosemary or lavender, as these will provide the warmth required to relax the muscles. Lavender Oil massage will also increase blood circulation. Lavender Oil – Few Drops. Take a lukewarm water bath which relaxes your muscles. Massage your neck with a few drops of lavender oil gently for 10 to 15 minutes. Repeat this again to get rid of neck pain. Cayenne pepper is a rich source of capsaicin which treats the neck pain by reducing the impact of pain signals on the body. Capsaicin boosts the release of a compound which reduce the pain in the areas of the neck and spinal cord. 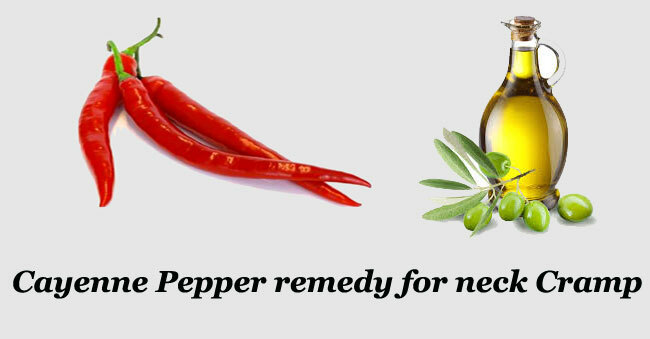 Cayenne pepper is another effective remedy to get rid of a neck pain. Cayenne pepper contains capsaicin that has pain-relieving and anti-inflammatory properties, which help reduce pain and inflammation. Cayenne pepper powder – 1 table spoon. Mix one teaspoon of cayenne pepper powder to two tablespoons of lukewarm olive oil. Stire it well and then apply it on the sore Neck muscles. Follow this remedy twice daily until the pain is gone. Get a capsaicin cream and rub it gently on your stiff neck muscles for quick relief. You can use this cream a few times a day. Ginger is an all-rounder when it comes to body infirmity. It is a natural anti-inflammatory agent which improves blood flow and circulation to the affected neck area. The Improved blood flow helps lessen pain as well as inflammation. Ginger helps in the reduction of impatience of the blood vessels in your head, resulting in getting rid of the pain. Boil two cups of water in medium flame. Slice the ginger into small pieces and add those to the boiling water, and boil for 10 minutes. Strain it, add 1 tsp of honey to it and stir well. Drink it to get rid of neck pain. Ginger Powder – 1 ½ tablespoon. Take one glass of water and mix the ginger powder in it gently. Drink this warm ginger water thrice a day to get relief from the kink in neck. You can also add a teaspoon of ginger powder to your regular tea every day to get the nutrition benefits. Massage few drops of ginger oil on the affected neck area to get rid of neck pain. Turmeric’s curcumin is a significant phytochemical that acts as an anti-inflammatory agent and hence helps to reduce pain. 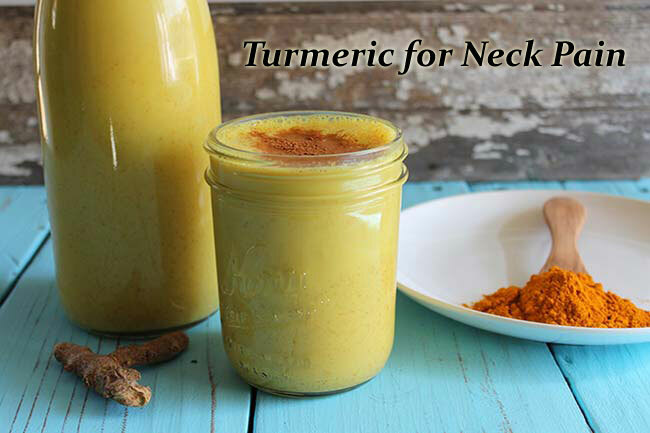 You can also use turmeric to treat pain in the neck pain because of its essential antibiotic properties. Turmeric helps improve blood circulation, which helps speed up the pain recovery process. Turmeric powder – 2 tablespoons. Boil it over low heat for five minutes. Remove from heat, add the little honey and keep away it to cool. Drink this twice a day until your constant neck pain is gone completely. Acupuncture exercises are great for problems such as stiff neck, so you should try this at home, preferably with the assistance of another person. Make sure you research the techniques properly before doing this, however. Massage gently the point on the opposite side of the body from the neck pain. If your right side of neck hurts, massage the point on your left hand. You will need to massage this point by pressing into it with the tip of your finger. Make sure to use enough pressure to feel slight tenderness at the point. Maintain that pressure gently while making very small circles with your pressing finger. 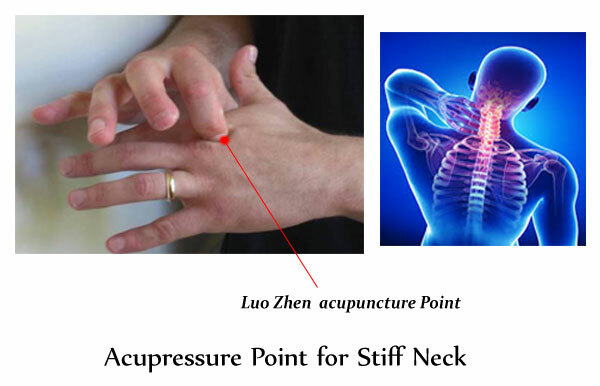 At the same time as you are stimulating the Acupuncture point, exercise the neck by rotating your head side to side. You should slowly begin to notice a slight increase in your range of motion while experiencing a decrease in pain. Do simple neck exercises every day. Maintain a proper sitting posture. Do not stand or sit in one position for a longer period. Use a firm neck pillow to get rid of neck pain. Change your posture regularly in the Workstation. Practice meditation to avoid Stress. Set your computer monitor at eye level. Avoid stress as it is considered as one of the main causes of neck pain. Give gentle massages to your neck regularly. Swim regularly to strengthen the neck muscles. Take rest and take a break from your regular exercise routine if you are suffering from neck pain. Do not wear a neck collar without the expert advice as it may worsen the condition. Avoid driving if you are unable to move your head due to Sore neck. Consume foods rich in resveratrol, such as red grapes, blueberry, peanut butter, dark chocolate, etc. Get 15 – 20 minutes of sun exposure to get the Vitamin D, which will help you experience fewer pains in the body.